Peter of Verona was an inquisitor and martyr born in Verona, Italy, in 1205. His parents were adherents of the Manichrean heresy, which still survived in northern Italy in the thirteenth century. Sent to a Catholic school, and later to the University of Bologna, he there met St. Dominic, and entered the Order of the Friars Preachers. 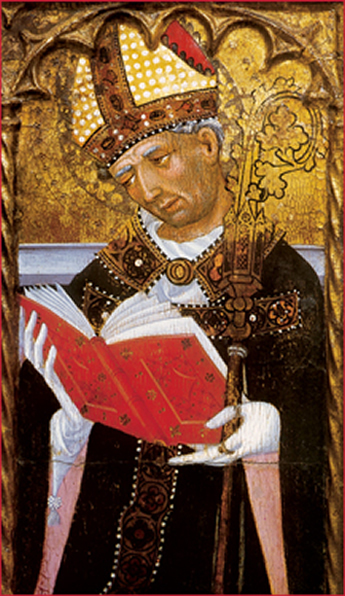 Such were his virtues, severity of life and doctrine, talent for preaching, and zeal £or the Faith, that Gregory IX made him general inquisitor, and his superiors destined him to combat the Manichrean errors. In that capacity he evangelized nearly the whole of Italy, preaching in Rome, Florence, Bologna, Genoa, and Como. Crowds came to meet him and followed him wherever he went; and conversions were numerous. He never failed to denounce the vices and errors of Catholics who confessed the Faith by words, but in deeds denied it. The Manichreans did all they could to compel the inquisitor to cease from preaching against their errors and propaganda. Persecutions, calumnies, threats, nothing was left untried. When returning from Como to Milan, he met a certain Carino who with some other Manichreans had plotted to murder him. The assassin struck him with an axe on the head with such violence, that the holy man fell half dead. Rising to his knees he recited the first article of the Symbol of the Apostles, and offering his blood as a sacrifice to God he dipped his fingers in it and wrote on the ground the words: "Credo in Deum". The murderer then pierced his heart. The body was carried to Milan and laid in the church of St. Eustorgio, where a magnificent mausoleum, the work of Balduccio Pisano, was erected to his memory. He wrought many miracles when living, but they were even more numerous after his martyrdom, so that Innocent IV canonized him on March 25, 1253. Saint Philip Neri (San Filippo Neri) was born on July 21, 1515, in Florence, Italy and died on May 26, 1595, in Rome. 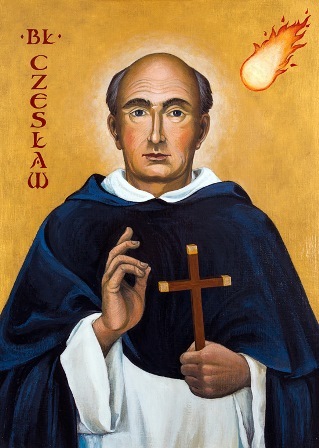 He was canonized in 1622 and his feast day is May 26. He was an Italian priest and one of the outstanding mystics during the Counter-Reformation and founder of the Congregation of the Oratory (now the Institute of the Oratory of St. Philip Neri, also called Oratorians), a congregation of secular priests and clerics. He went to Rome c. 1533, where he tutored, studied, and undertook many charitable works. In 1548 he founded a society of laymen dedicated to the care of the poor, convalescents, and pilgrims. After ordination in 1551 he moved to the ecclesiastical community at San Girolamo della Carita in Rome. There he held religious conferences that became so popular that a large room was built over the church nave to accommodate his audiences. This room was called the Oratory, a name that subsequently referred to those who met there and to the devotional, charitable, and recreational activities that Philip instituted, including musical performances (hence "oratorio"). Philip was rector of the church of San Giovanni from 1564 to 1575, during which period he ordained his disciples. In 1575 Pope Gregory XIII granted him Sta. Maria in Vallicella, where he established the Institute of the Oratory. A house was built for the priests, and Philip, elected provost of the congregation in 1577, resided there after 1583. Although Philip helped influence Pope Clement VIII to absolve (1595) King Henry IV of France from excommunication, he had little to do with contemporary political events. Noted for his personal spirituality, he underwent numerous ecstatic religious experiences, and many miracles were attributed to him. How does one qualify to be an apostle? The first act of the apostles after the Ascension of Jesus was to find a replacement for Judas. With all the questions, doubts, and dangers facing them, they chose to focus their attention on finding a twelfth apostle. Why was this important? Twelve was a very important number to the Chosen People: twelve was the number of the twelve tribes of Israel. If the new Israel was to come from the disciples of Jesus, a twelfth apostle was needed. But Jesus had chosen the original twelve. How could they know whom he would choose? One hundred and twenty people were gathered for prayer and reflection in the upper room, when Peter stood up to propose the way to make the choice. Peter had one criterion, that, like Andrew, James, John, and himself, the new apostle be someone who had been a disciple from the very beginning, from his baptism by John until the Ascension. The reason for this was simple, the new apostle must be a witness to Jesus' resurrection. He must have followed Jesus before anyone knew him, stayed with him when he made enemies, and believed in him when he spoke of the cross and of eating his body-teachings that had made others melt away. Two men fit this description-Matthias and Joseph called Barsabbas. They knew that both these men had been with them and with Jesus through his whole ministry. But which one had the heart to become a witness to his resurrection. The apostles knew that only the Lord could know what was in the heart of each. They cast lots in order to discover God's will and Matthias was chosen. He was the twelfth apostle and the group was whole again as they waited for the coming of the Holy Spirit. That's the first we hear of Matthias in Scripture, and the last. Legends like the Acts of Andrew and Matthias testify to Matthias' enthusiastic embrace of all that being an apostle meant including evangelization, persecution, and death in the service of the Lord. How does one qualify to be an apostle? Clement of Alexandria says that Matthias, like all the other apostles, was not chosen by Jesus for what he already was, but for what Jesus foresaw he would become. He was elected not because he was worthy but because he would become worthy. Jesus chooses all of us in the same way. What does Jesus want you to become?-a follower in His footsteps. Margaret was born in 1242, the daughter of Bela IV, King of Hungary, and Maria Lascaris, daughter of the emperor of Constantinople. Before her birth her parents had vowed to dedicate their child to God if Hungary would be victorious over the invading Tartars. Their prayers were answered and so when four years old was placed in the Dominican monastery of Veszprim. At the age of twelve she moved to a new monastery built by her father near Buda and their made profession into the hands of Humbert of Romans. Margaret lived a life totally dedicated to Christ crucified and inspired her sisters by her asceticism, her works of mercy, her pursuit of peace, and her humble service. She had a special love for the Eucharist and the Passion of Christ and showed a special devotion to the Holy Spirit and Our Lady.